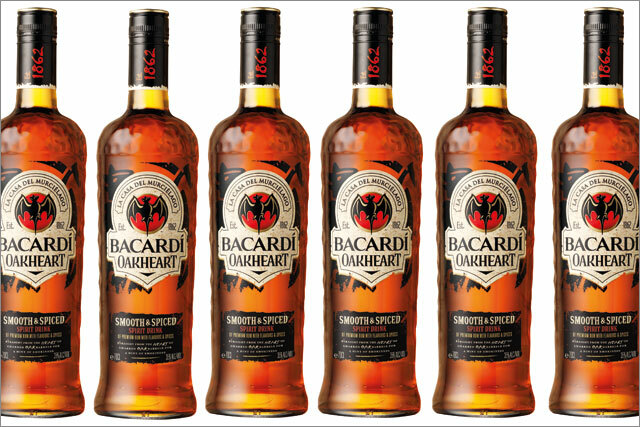 Bacardi is launching a premium spiced rum brand extension called Bacardi Oakheart, backed by a £3m ad campaign in the UK. The smoky tasting variant is rolling out globally and is aimed at young men. It will be available in the off-trade for a recommended retail price of £17.39 for a 70cl bottle from September. Oakheart will be supported by a £3m campaign across print, digital and outdoor advertising, created by Y&R. Point of sale and national sampling will also form part of the marketing mix. Liam Newton, Bacardi Brown-Forman marketing director, said of the launch: "It's been driven by the knowledge that consumers are looking for something different and more adventurous to add to their drinking repertoire. "Bacardi Oakheart fills a gap in the market for a spiced rum brand with a distinctly masculine, smoky edge that appeals directly to guys that know life is about the experiences they share with friends." Newton added that he hoped consumers would adopt the nickname "Oak and Coke" when ordering the drink at a bar. Currently worth just over £37m in the Off-Trade, with current growth rates it is predicted the spiced rum category could grow to be worth £150m in the UK over the next five years, according to Nielsen. The death of the brand website?